Using AirPlay is easy. 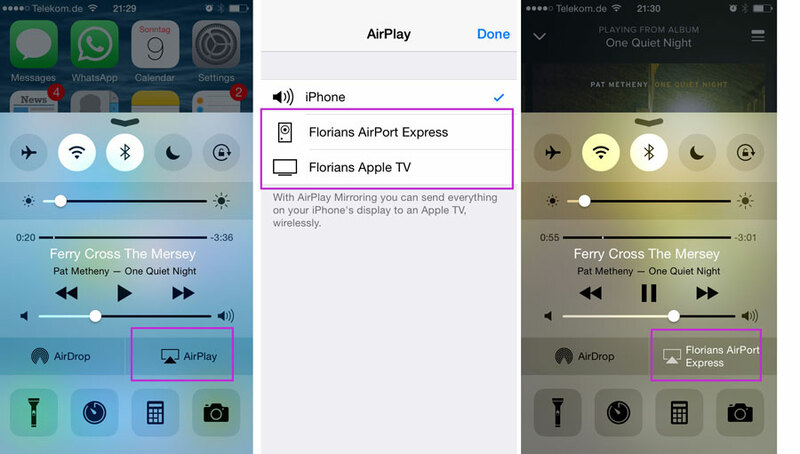 Here’s a short how-to for AirPlay streaming on your iPhone or iPad. Make sure that your devices (Apple TV, iPhone, iPad, iPod) are in the same network. Swipe up from the bottom of your screen. The Control Center appears. You can see a list of possible AirPlay receivers, each with a TV or a speaker icon which shows what kind of content you can stream to it. Another way to switch to switch to an AirPlay device is within an App. Apps that support AirPlay show a small icon that gives you quick access to the available Airplay devices. AirPlay can be used across all of your apps and content that allow AirPlay. It’s important to understand that if you turn it (like described above), it’s on globally activated. So it will work across your Apps until you deactivate it. AirPlay from iphone/ipad to Mac with Elmedia Player PRO. Currently for iOS 9 and newer Elmedia only offers audio streaming. hey – this is a nice overview for airplay with iOS devices. Related, how do I stream the audio from a movie rental in iTunes to a set of speakers connected via airport express? @Joseph: In a nutshell: You can see the AirPlay Icon in the iTunes navigation bar (= where the play button is). Click it and you should see the airport express there. thanks – I’m not sure how I missed that – I actually had changed the sound output in preferences to the airplay enabled speakers, which worked too. but now I see the airplay icon in the navigation bar to the right of the play button. My wife’s iPhone connects to my hearing aids by air play. She hears no incoming voice calls but I hear the person that is calling. She deleted the app for my hearing aids but that didn’t help. How can she remove my hearing adds from air play? The airplay will only show speakers instead of monitors on some of the ipads and phones but some ipads and phones works correctly. Tried same wifi. Nothing works. Hi, I think I am having the same issue as Tonya above – my ipad has suddenly started showing only the speaker icon rather than the TV/screen icon so I can’t get the video up on the apple tv. This has never been an issue before and I am having no issue with my iphone, any ideas? Hi! So, same deal as Edward and Tonya above. I have searched all over and cannot find any solution. Both my iphone and ipad only show a speaker icon when attemnpting to connect to my ATV; the device will not accept video. Because I am at a school, I can test my handhelds on other ATV devices. I have gone into many other classrooms with AppleTV and can mirror video and sound both in those rooms. Tried restarting all units to no avail. Everything is on the same network. I have not been able to find any postings about this elsewhere. Any suggestions? Hi. I have the same problem as Tony’s ..Edward..and grey…….someone please help.